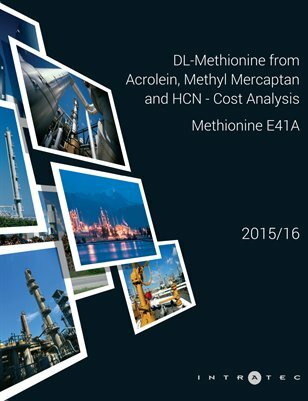 This report presents a cost analysis of DL-Methionine production from acrolein, methyl mercaptan, and hydrogen cyanide (HCN). The process examined is a typical carbonate process. In this process, refined acrolein and methyl mercaptan are reacted to form MMP (also called methional), which is further reacted with hydrogen cyanide to generate DL-Methionine. This multi-step process includes: methional production; hydantoin intermediate production (from methional and hydrogen cyanide); reaction of hydantoin with potassium carbonate to produce potassium methioninate; and methioninate conversion to DL-Methionine. This in-depth, independent study provides readers with key and hard-to-find information regarding a production process technology and its economics, such as a description of the manufacturing process and industrial site installations, plant construction cost breakdown, production cost breakdown, and raw materials consumption figures.